• Features a specially designed elastomer between the steel plates providing compressibility and elongation for concrete movement. • Custom Cuts for exact slab depth. • Available in custom sizes up to 12 feet. • 3 inch offset is provided on lengths up to 12 feet for assembly to adjacent forms. 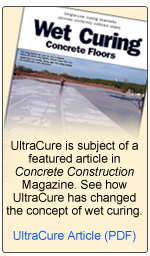 The concrete edge protection system. The EZedge™ is an innovative concrete edge protection system designed to provide superior protection and load transfer while saving labor costs on installation. 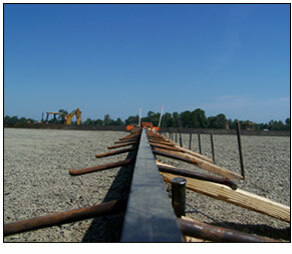 EZedge™ is shipped pre-mounted on the EZform™ board eliminating time consuming field “fit-ups”. The attached EZform™ board also comes standard with pre-cut dowel slots, which eliminate the need to nail dowel holders to traditional lumber. EZedge™ has several unique advantages over traditional edge protectors. The system is shipped in standard sizes, or to your specific height requirements creating an exact slab depth. The cold rolled steel has a unique proprietary bonding system, which eliminates removing nuts and bolts and cutting tack welds- meaning less chances of missing welds and potentially locking the slab. The patent pending EZedge™ load transfer concrete edge protection system is part of the EZform System™ designed for construction and contraction joints. 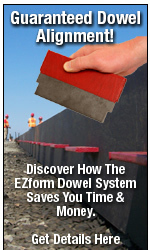 The system includes: EZform™ board, EZdowel™ load transfer device, EZedge™, and EZbasket™.